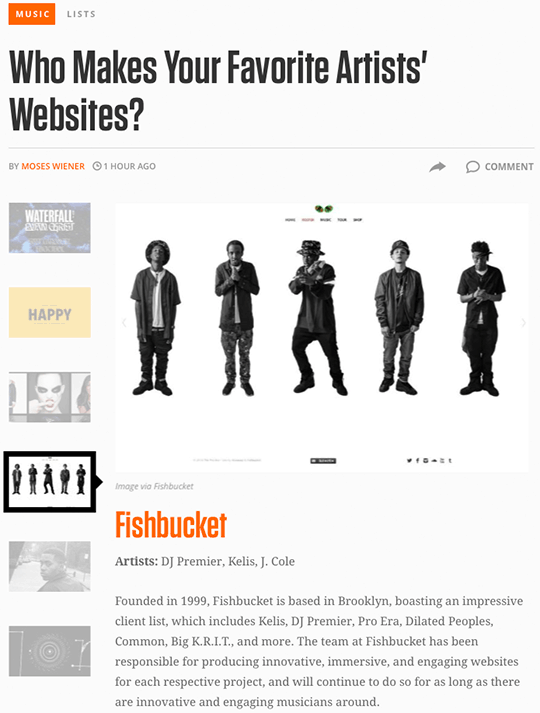 We were surprised and honored today to hear that Fishbucket was featured on Complex’s “Who Makes Your Favorite Artists’ Websites” list. Funny that they called out Kelis, which was over a decade ago, but kind of fitting since that was one of our big sites in the early years. From Kelis in 2003 to Pro Era in 2014, it’s been a wild ride and it’s great to get some random recognition for it. A new site for the biggest name on our client list will be launching in the next few weeks, so stay tuned. We’re not done yet!